Enjoy your holiday season with Christmas At The Galt House Hotel! Explore “12 Days of Christmas” as told through larger-than-life handcrafted silk luminaries, plus so much more for the young and young at heart! Come see traditional favorites like Holly Jolly Elf Show, Christmas Village, Winter WonderLane and the Dancing Bellmen. Plus all-new this year, see KaLightoscope: 12 Days of Christmas and A Very Merry Magic Show! This is a Christmas event you don't want to miss. When: November 18-19, 10 a.m.-8 p.m. & November 20, noon-6 p.m.
Where: Galt House Hotel, 140 N. Fourth St. The Louisville Orchestra joins in the city-wide celebration of William Shakespeare with a concert of works inspired by his genius. There will be a pre-concert lecture at 10 a.m. on Friday and at 7 p.m. on Saturday. When: November 18, 11 a.m.-12:30 p.m. & November 18, 8-9:30 p.m. Enjoy time with friends and family at the 10th annual Ladies Day at the Races all while supporting a worthy cause! Watch the races, bid on one-of-a-kind auction items, participate in the lucky draw for fine wine, view the latest seasonal looks from local boutiques in the fashion show and enjoy a delicious lunch buffet. Proceeds benefit Backside Learning Center, supporting equine workers and their families. When: November 18, noon-6 p.m.
Five Finger Death Punch and Shinedown are partnering to co-headline the biggest Fall Arena Rock Tour 2016! The tour is also highlighted by Special Guest SIXX:A.M. featuring vocalist/producer James Michael, bassist Nikki Sixx and guitarist Dj Ashba. UK newcomers As Lions, featuring Austin Dickinson, will round out the supporting lineup. Celebrate the Festival of Lights with AICH. Enjoy samples of Indian cuisine, a Samosa making demonstration, learn about Indian Masalas (spices), get a henna tattoo, try your feet on the basics of Bhangra dance and much more. Space is running out, reserve your spot now! When: November 18, 6-8 p.m.
Where: AICH, 1244 S. Third St.
Bill Nye, scientist, engineer, comedian, author and inventor is a man with a mission: to help foster a scientifically literate society, to help people everywhere understand and appreciate the science that makes our world work. Making science entertaining and accessible is something Bill has been doing most of his life. Nye's talk is titled "The Earth is a Great Home, But We Have to Make Some Changes." When: November 18, 7-9 p.m.
John Prine is an acclaimed singer/songwriter whose work flirted with everything from acoustic folk to rockabilly to straight-ahead country. Come hear this jack-of-all-trades perform at the Palace this Friday. When: November 18, 8-11:30 p.m.
DJ Akib is bringing his explosive set to SET! From rocking out sold out Nightclubs in Chicago to Spinning at Red Carpet events on the West Coast, DJ Akib has done it all. His explosive sets and ability to cater to any audience have made Akib one of the most sought after DJs nationwide. He has performed for some top celebrities such as Ke$ha, Lady Gaga, Tiesto, Far East Movement, Twista and has been featured on TLC’s 4 Weddings, MTV and various news stations around the US. When: November 18, 10 p.m. The Commissioner's Cup Celebration will again take place in Louisville. The event honors the winners of the Kentucky Commonwealth Commercial Wine Competition & Commissioner's Cup, the highest recognition awarded in the Commonwealth to the top Kentucky wine of the year in each of the following categories: Dry Red Wine, Dry White Wine, Rose/Blush Wine, Sweet/Dessert Style/Fruit Wine and Boutique (Small Production) Wine. The celebration will be held at the Speed Museum this Saturday at 7 p.m. and includes tastings from the 2016 Commissioner's Cup winning wines as well as gold medal winners, hors d’oeuvres by Wiltshire and the chance to learn more about the time-honored tradition of KY wine in our state. When: November 19, 7-11 p.m.
Brian Joseph Regan is an American stand-up comedian who uses observational, sarcastic and self-deprecating humor. His performances are relatively clean as he refrains from profanity and off-color humor. Regan's material typically covers everyday events, such as shipping a package with UPS and a visit to an optometrist. Regan makes frequent references to childhood, including little league baseball, grade school spelling bees and science projects. When: November 19, 8-10 p.m.
Join us for an evening of free Holiday Festivities on Saturday from 5-8 p.m. Join us for carolers, magicians, a juggler, stilt walker, Frosty and many special guests, including Santa's arrival at 7 p.m.! Guests will receive a free $10 gift Tenant Gift Card with receipts totaling $25 from any of Paddock Shops Stores or Restaurants. One gift per customer while supplies last. When: November 19, 5-8 p.m. The holidays are coming up, and it's time to take a look at what we have to be thankful in our lives and what we can do to help out those less fortunate. Improv Anonymous is going to be in the upstairs lounge of Four Pegs ready to perform for you, for the low price of a donation of at least one canned good to go to the Dare to Care Food Bank. You get two hours of funny bone-tickling comedy along with the feeling of knowing that you've done something to help those in your community. Where: Four Pegs Beer Lounge, 1053 Goss Ave.
With a combined Pink Floyd tribute band experience of over 40 years, Pink Droyd attempts to recreate the experience that was Pink Floyd. This live cast brings the music to life at a time when the appreciation of Pink Floyd has never been greater. Santa’s workshop is bustling on the day before the big parade. His staff needs to check some last-minute details with Mr. Macy, but when they open his office door, they find Mr. Macy dead! But how is that possible? Everyone knows that only fictional characters exist, and they can’t die! Seating is limited, so reserve your seats early! Price includes dinner, show, tax and gratuity. Where: Bristol Bar & Grille Downtown, 614 W. Main St.
Join Scrooge as he travels through time meeting new and old friends along the way. Come out for a fun, hands-on exploration of the beloved world of A Christmas Carol. This workshop is best enjoyed by children 18 months to 5 years. However, siblings and older children are welcome to attend. (Please, only 2 adults for each ticketed child). When: November 19, 10:30-11:15 a.m.
Where: Actors Theatre, 315 W. Market St.
Twenty-five-year-old Australian Joe Robinson is considered uniquely gifted as a virtuoso guitarist and singer/songwriter. He walks a tightrope between the instrumental music that has put him in the spotlight and a unique fusion of vocally-based rock, blues, jazz and R&B that is entirely his own. Born in the backwoods of Temagog, on the mid-north coast of New South Wales, Australia, his six-string ability and compositional insight have already earned him a worldwide following. When: November 20, 7-9:30 p.m.
Save the date and get ready to pucker up for this very special and sour Holy Grale holiday. On this incomparable occasion, the Grale will be tapping into their cellar reserves of all things sour, funky and wild. When: November 20, noon-10 p.m. 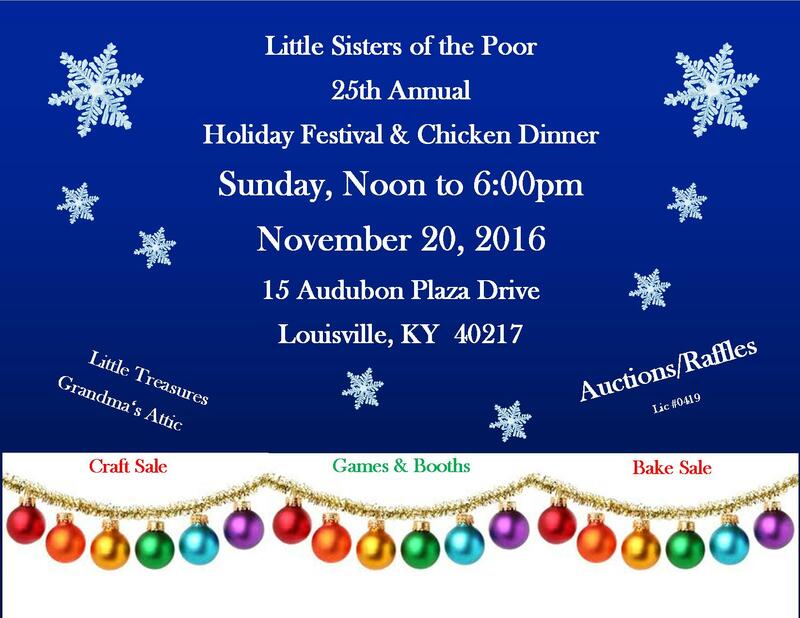 This Saturday, Little Sisters of the Poor are hosting their annual Holiday Festival & Chicken Dinner! There will be a bake sale, craft sale, auctions and raffles in addition to several games and booths. When: November 13, noon-6 p.m. The Louisville Youth Orchestra will perform at the Brown Theatre, featuring the Concert, Repertory and Symphony Orchestras of the LYO. Founded in 1958, the LYO provides an extraordinary musical experience for young people from grade school through age 21. There are nearly 350 musicians from 60 schools and 15 counties in the Louisville and Southern Indiana metro area. When: November 20, 4-6:30 p.m. The stage will be crowded at The New Vintage this Sunday! Alanna Royale, with seven members and Zach Longoria Project, with eleven, will perform. This year’s Snowflake Shoppe will feature nearly 80 vendors and encompass the entire first floor of The J. Gifts available for purchase will include leather goods, customized wreaths, monogrammed gifts, hand-painted glassware, wine accessories, local handmade jewelry, locally handcrafted soaps, pet items, toys, books, women and children’s clothing and accessories, home decor, Kentucky Proud items and more. When: November 20, 10 a.m.-9 p.m.